The 4-point stance features 4 points of contact with the ground, as the defender has both hands and both feet on the ground with his weight sitting forward slightly. There are three variations of the four point stance: One where an interior defender has their weight forward to gain immediate leverage against an offensive lineman; another where an edge defender has their weight forward to improve their burst off the ball; and a third where a defensive lineman is leaning back slightly (sometimes called a frog stance) to better position themselves to 2-gap in run defense. The differences in weight distribution all affect the defensive lineman’s upfield burst and how it should be evaluated. The 4-point stance is used most by the majority of defensive fronts in short yardage situations along the interior of defensive lines, as they need to be the first to move off the ball and stun the offensive line to stop what will likely be an inside run play from the offense. It gives the defensive lineman a lower stance and better leverage to immediately stack the offensive line and prevent a running lane from developing. Below is an example of defenders using the 4-point stance in a short yardage situation, as the Miami Dolphins are facing third and goal from the 1-yard line against the New England Patriots in Week 17. The Patriots have five down linemen on the field against the Dolphins’ double tight end set. Both Malcolm Brown (#90) and Rufus Johnson (#70) are in four point stances along the interior of the Patriots defensive line, while the other three down linemen are in three point stances. 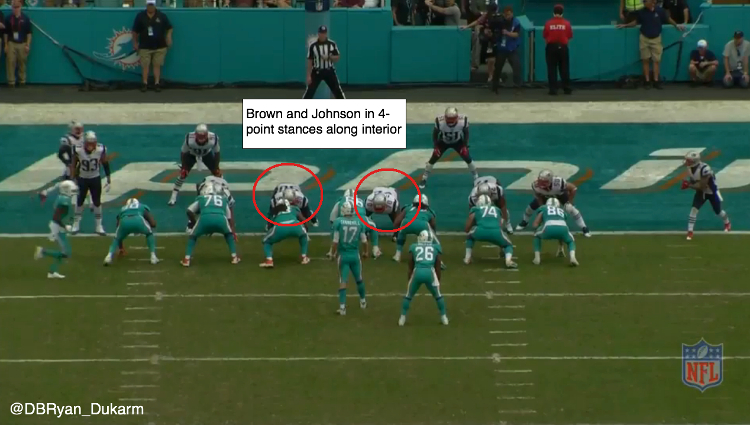 At the snap, both Brown and Johnson are able play with better leverage than the Miami offensive line and create a traffic jam in the middle of the running lane. Dolphins running back Lamar Miller is not given any room to run and gets tackled for no gain. Defenses run by those from the Gregg Williams and Jim Schwartz coaching trees, like Defensive Line coach Jim Washburn, now with the Dolphins, ask EDGE defenders (4-3 DE and 3-4 OLB) to use the four point stance to get a better jump on the snap and use their speed to generate pressures and sacks. For example, Jason Babin’s only two productive years of his career came using the technique for Coach Washburn in Tennessee (2010) and Philadelphia (2011). One example of an EDGE defender using a four point stance to rush the passer can be seen below, courtesy of Texas A&M defensive end Myles Garrett. Garrett utilizes a four point stance to come off the ball quickly with good burst upfield, and establishes his hands to the chest of the left tackle to convert his speed to power and walk the tackle into the quarterback for a sack. One of the biggest downsides of the aggressive four point stance is that defenders will use the speed it provides off the line but end up getting too far upfield, effectively taking themselves out of the play, which is why many defenders use it only in obvious passing situations. The third and final type of four point stance is used to set up a defensive lineman to 2-gap in run defense. This stance has less weight on the defender’s hands and more on their feet, as they sit back in a squatted position to come off the ball ready to stack the offensive linemen with their hands in run defense posture. Below is an example of the four point stance being used to 2-gap in run defense, courtesy of Oregon defensive lineman Henry Mondeaux (#92). Mondeaux sits back with his weight primarily on his feet, ready to establish his hands in the chest of the offensive lineman in front of him. 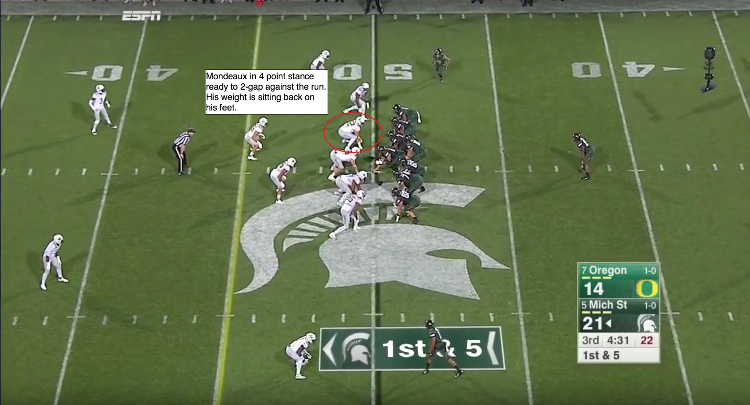 At the snap, Mondeaux reads run and shoots his hands at the Michigan State right tackle, establishing control and allowing him to shed depending on the gap the running back decides to attack. When the Michigan State running back nears him, Mondeaux is able to lock out the offensive lineman and shed so he can make a tackle to limit the run to a 3 yard gain. 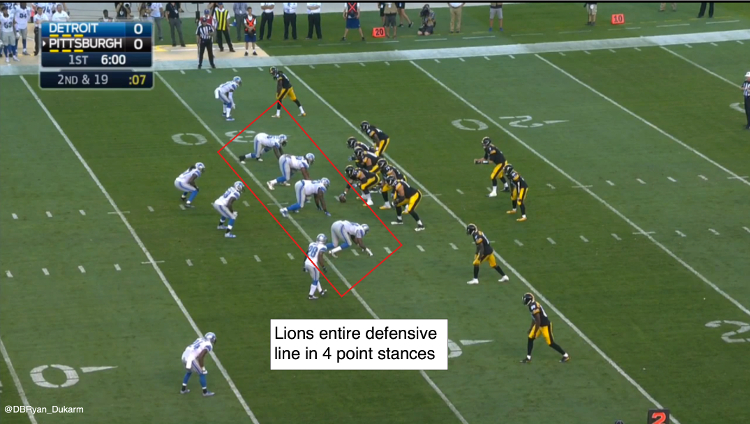 In conclusion, the four point stance is incredibly versatile in its usage, as it can be used to: Clog run lanes in short yardage situations; gain speed and burst as an EDGE rusher; or to set a defender up to 2-gap in run defense.